New experiment suggests worms could thrive in Martian soil. In what could be an important milestone for future farmers on Mars, two healthy baby worms were recently born in simulated Martian soil. The births took place in an experiment that is helping scientists understand how human settlers might one day grow crops on the Red Planet. Wieger Wamelink, a biologist at Wageningen University and Research Centre in the Netherlands, is running plant growth experiments in a mixture of NASA-made Martian soil simulants — made from volcanic terrestrial rocks — and pig manure, to which he added live adult worms. University officials said in a statement that the infant worms are the first offspring of adult worms to be born in a Mars soil simulant. 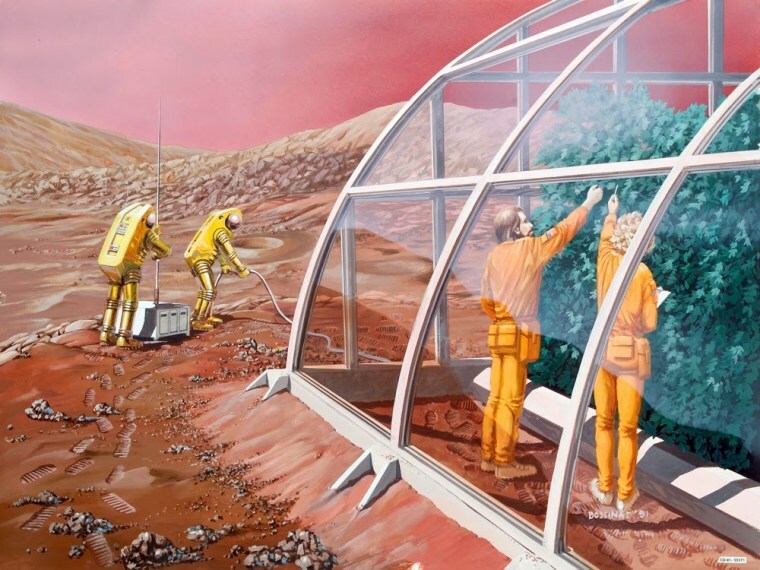 Mars is not a naturally habitable environment for life as we know it, so if humans want to live there long term, Red Planet settlers will have to establish closed ecosystem models. (These are essentially large terrariums where factors like temperature and atmospheric moisture can be controlled.) According to the statement, those ecosystems will ideally utilize available waste materials, including human excrement and dead organic matter. That's where the worms come in. Worms begin the breakdown of organic matter, which is continued by bacteria. That leads to the release into the soil of such vital plant nutrients as nitrogen, phosphorous and potassium, according to the statement from Wageningen University and Research. The researchers also found that the holes that worms dig in the soil aerate the mixture and improve the soil's structure, making it easier for water to penetrate the soil and nourish plants. The appearance of baby worms seems to indicate that at least in the short term, the worms are thriving in these closed ecosystems. Will Mars colonists snooze their way to the Red Planet? The goal of the experiment is to find out how well worms break down old waste to produce food for bacteria and plants in the mixture of soil simulant and pig slurry (or manure). Various flowering plants were allowed to germinate in several pots of this mix, and adult worms were then added. A crowdfunding campaign has been launched to continue experiments on these hardy worms. "Worms for Mars" has already raised more than half their funding goal of €10K, and with the public's help, Wageningen University and Research hopes to continue testing out different crops along with their crawling assistants.There is is the possibility that sharp edges in non-Earth soil could damage the guts of the critters, the researchers said in another statement. When worms eat organic matter, they also eat the soil. Since there isn't much weathering of Martian terrain, sharp edges in its soil do not get worn down (the way they do on Earth) and may cause worms harm, according to the statement. The presence of heavy metals in Martian soil could also be a long-term problem for worms, which would require lengthier experiments to address properly, the researchers said.